This French Chocolate Pie is delicious - so much so it quickly becomes addictive. I have been making it for over 3 decades at the restaurant and people never get tired of it. 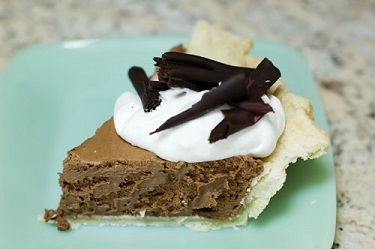 This chocolate pie is easy to make but it is so popular the restaurant still has a tough time just keeping it in the "house." 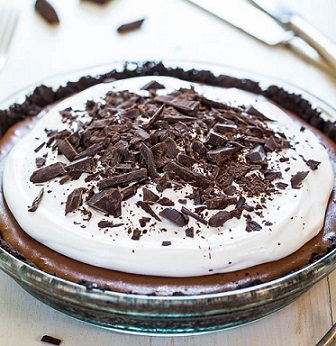 This pie recipe is basically a delicious chocolate mousse in a pie crust or Oreo pie crust. You'll really like it! Tip: To bring butter to room temperature quickly, use a grater to shred it into your mixing bowl. Tip: Add a tablespoon of Dream whip to each cup of whipping cream. It will hold up better in your desserts. Enjoy your Pie and the company of those you share it with! "Cut my pie into four pieces. I don't think I could eat eight."